Working form my studio at home in Bristol, I create pieces for exhibit in London and the South of England. My work focuses on birds and animals whose forms are suggested to me by the shapes and properties of found materials. As a child I tracked down creatures in the garden, My passion for natural history only equalled by my love of art. It was a natural progression for me to study scientific illustration however feeling the need for a more creatively challenging course I moved to Central St Martin's, London. There I evolved a sculptural method which allowed me to creatively examine the world of wildlife. 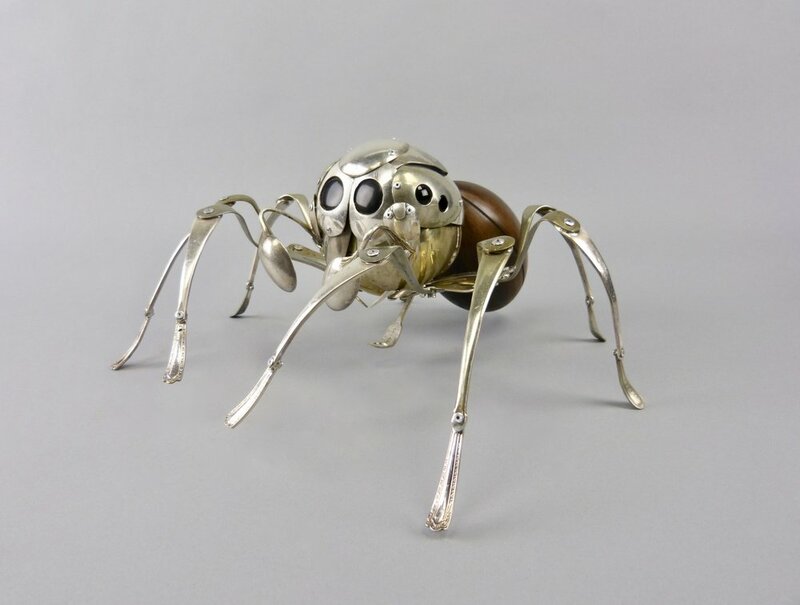 Using silverware and shoe trees, brushes and old car seat leather, sourcing materials which are strangely appropriate in their form or origin to the animal they sculpt. Describing an animal’s physical appearance, their behaviour and character, creating life-like creatures with accuracy and humour.